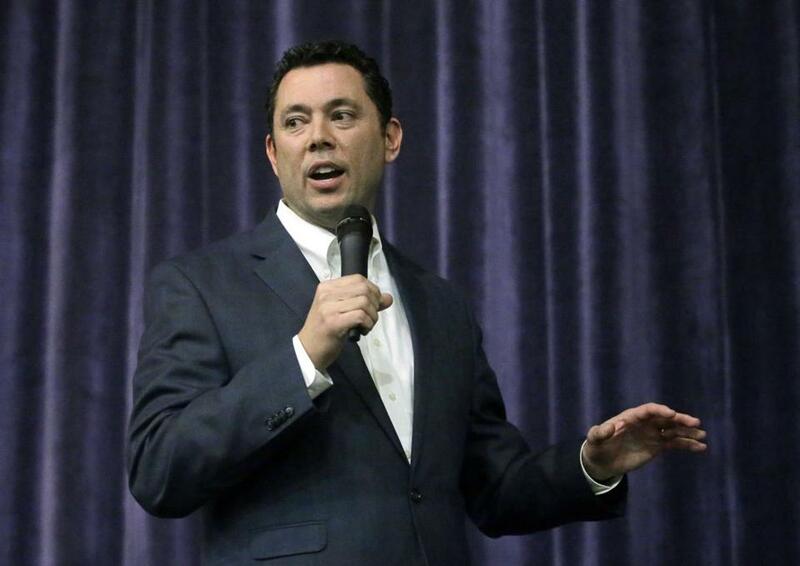 Rep. Jason Chaffetz spoke during a town hall meeting. ‘‘We have a major problem here in Salt Lake Valley, with the inversion,’’ Chaffetz said. He told the crowd gathered at a high school in a Salt Lake City suburb that he supports solar energy, but that it can have its own negative impact on animals and wildlife. The chairman of the House Oversight Committee repeatedly said, ‘‘hold on,’’ and ‘‘give me a second,’’ as the audience members reacted negatively to nearly all of his statements. Hundreds of people stood outside the auditorium holding signs and chanting, ‘‘Vote him out,’’ while one woman was arrested and put into handcuffs. ‘‘Protecting your public lands provides a better future for not only communities and people who are visiting, but also habitats and revenue,’’ she said. The Mormon congressman said he empathizes and if Trump imposes a ‘‘religious litmus test,’’ he’ll push back. ‘‘We should know a few things about being a religious minority,’’ he said. ‘‘My job is not to be a cheerleader for the president,’’ Chaffetz said.